We check each and every id for accuracy before shipment. Not only do you approve the scans before we ship, but we do a full quality check, and test magnetic stripes and/or barcodes. Rest assured your fake id will arrive without incident. We go to extremes (which we do not detail publicly) to ensure your fakes are not seized by Customs. To date, we have not had one single order detected by Customs! We have only had one unfortunate, and almost UNBELIEVABLE issue we had a while back that ended up making the news Link Here. This prompted us to revamp our concealment method to another level. It should go without saying, but our fake ids pass every test a real license will pass. 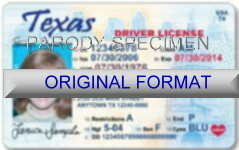 We print on the same card stock and grade for each fake we offer as the real id is printed on. Every fake we make will 100% pass in-state. Our high-density, tri-color UV ink prints exact, crisp, and clear. It will not fade, as it is the exact same ink used to print a real license. Ink which is made here in Address on Order Form, that we source from the same manufacturers. Yet another reason our fakes are virtually identical to real. All of our fake ids will scan when the real id has a magnetic stripe and/or bar codes (1D or 2D). We also replicate RFID chips which started with licenses in Australia. In the future, we expect more licenses to have this feature which is very easy to replicate. Of course, it is never to make a license secure, but another government spying tool. We believe governments will use them to monitor where citizens are at all times. Next, you will see RFID chips in all ids and covert RFID readers all over the place sending back the data to the government (like the NSA).